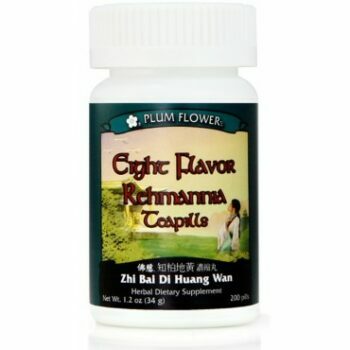 Eight Flavor Rehmannia Teapills - Zhi Bai Di Huang Wan | Wing Ming Herbs, Inc. Ingredients: Rehmannia glutinosa root-prep, Cornus officinalis fruit, Dioscorea opposita rhizome, Alisma orientalis rhizome, Paeonia suffruticosa root-bark, Poria cocos fungus, Phellodendron chinense bark, Anemarrhena asphodeloides rhizome, Botanical wax, Talcum. – Shu di huang, Shan zhu yu, Shan yao, Ze xie, Mu dan pi, Fu ling, Huang bai, Zhi mu, Botanical wax, Talcum.